96 • RV PRO • March 2019 rv-pro.com A F T E R M A R K E T "That's when we said, 'When we retire, one of the things we want to do is help solve the world's water issues,'" he says. "I was shocked that with all the money and technology we have today, we haven't figured out how to solve the world's drinking water issues." Fast-forward to 2015, when the Sztykiels formed Created 2 C with the idea of creating for-profit companies that would improve the world. Given their concern about water, Sztykiel contacted Yreka, Calif.-based Ozotech, about being the tech- nology partner on a water treatment venture. "They do very large activated-oxygen (also known as ozone, or 0 3 ) water purification systems for large companies and orga- nizations," Sztykiel says. "I told them we would like them to develop a system that weighs less than 10 pounds, draws less than 1-amp of power, and will make more than 2,000 gallons a day." Although that size and number are predicated on the average size of an African family, coupled with the average size of an African village that could be solar powered, in discussing his project with a friend in the RV industry, Sztykiel was told he Acuvatech Technologies took established technology for large-scale water purification and reduced it in size. The company's product combines UV LED technology to disinfect microorganisms and combines it with filters designed to remove sediments, chemicals and heavy metals. 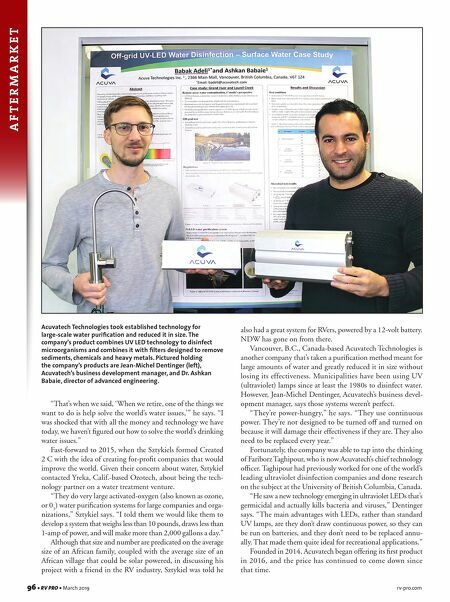 Pictured holding the company's products are Jean-Michel Dentinger (left), Acuvatech's business development manager, and Dr. Ashkan Babaie, director of advanced engineering. 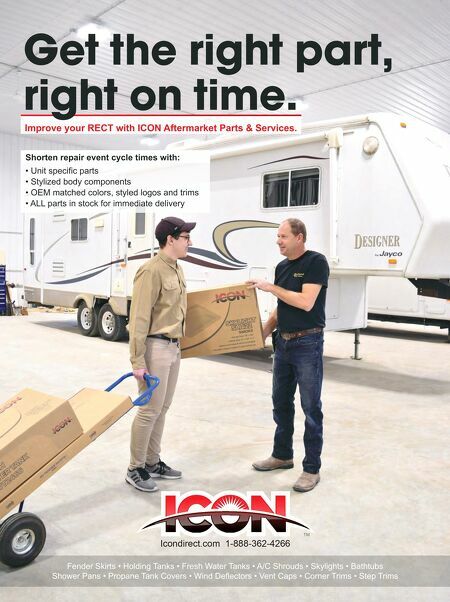 also had a great system for RVers, powered by a 12-volt battery. NDW has gone on from there. Vancouver, B.C., Canada-based Acuvatech Technologies is another company that's taken a purification method meant for large amounts of water and greatly reduced it in size without losing its effectiveness. Municipalities have been using UV (ultraviolet) lamps since at least the 1980s to disinfect water. However, Jean-Michel Dentinger, Acuvatech's business devel- opment manager, says those systems weren't perfect. "They're power-hungry," he says. "They use continuous power. They're not designed to be turned off and turned on because it will damage their effectiveness if they are. They also need to be replaced every year." Fortunately, the company was able to tap into the thinking of Fariborz Taghipour, who is now Acuvatech's chief technology officer. Taghipour had previously worked for one of the world's leading ultraviolet disinfection companies and done research on the subject at the University of British Columbia, Canada. "He saw a new technology emerging in ultraviolet LEDs that's germicidal and actually kills bacteria and viruses," Dentinger says. "The main advantages with LEDs, rather than standard UV lamps, are they don't draw continuous power, so they can be run on batteries, and they don't need to be replaced annu- ally. That made them quite ideal for recreational applications." Founded in 2014, Acuvatech began offering its first product in 2016, and the price has continued to come down since that time.